Calamarata Pasta | Pasta & Co.
It’s a great day for all pasta lovers!! One more day to enjoy your favorite pasta with whatever you like. 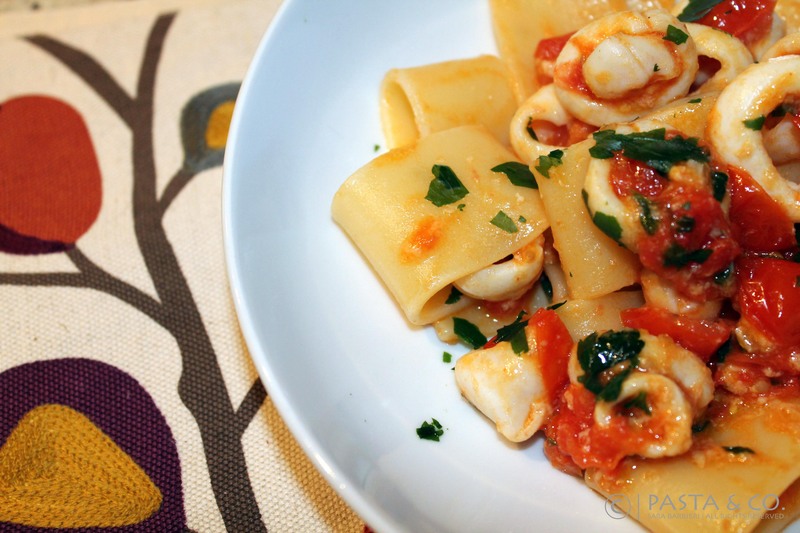 I’ll celebrate with Calamarata, which is a traditional pasta shape from the region of Napoli / Naples and very similar in shape to squids. The name Calamarata comes from “calamari”, which means squids. 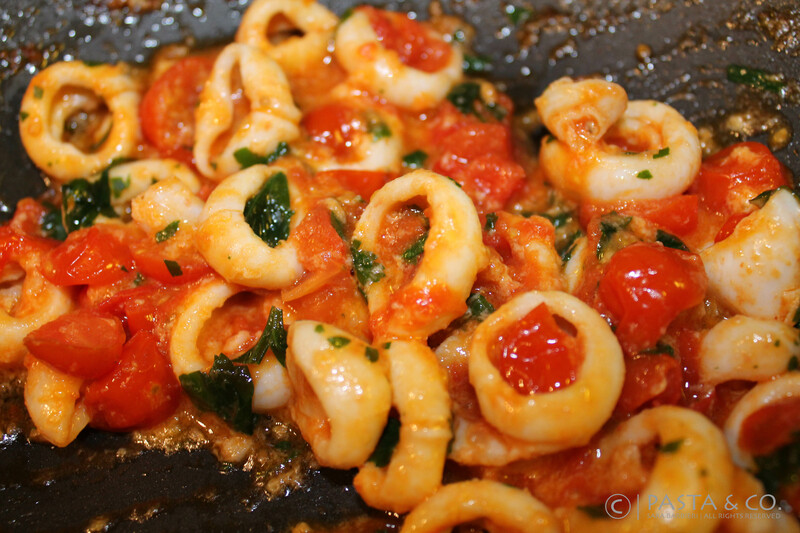 Calamarata itself gives the idea of a tasty mixture of calamari, fresh juicy tomatoes, somewhat garlicky and spicy. And that’s what this recipe is about! Calamarata and Paccheri are hardly found in stores. You may wanna buy it online – I buy them both at Gran Caffe Vuotto and I always pick Garofalo or any artisan brand they feature. 1) First of all, you’ve got to clean the squids. This tutorial can be useful if you buy fresh squids. Make sure they’re translucent and firm. Cut them into rings. Cut the tomatoes in half. 2) Fill a pot with 2/3 of salted water and bring it to boil. Add pasta. 3) Warm the oil in a pan and when hot, add both garlic and chili pepper. Stir gently over low heat. When garlic is golden (but not burnt! ), add the calamari rings and let it cook for 4 minutes. 4) When it starts absorbing, pour 1/2 glass of white wine and stir. When the wine has almost completely evaporated, add the cherry tomatoes, salt and pepper to taste.